Above: Gentlemen always find a comfortable environment as well as smart clothing at Badowers, on Ingersoll since the 1950s. Anyplace can offer a great deal from time to time. So we enjoy exploring different retailers with an open mind. But if we’re looking for something specific and want it now, these are the shops we visit first, with confidence in the staff as well as the merchandise. There’s a comfort we appreciate in dealing with retailers we have come to trust and respect. If you buy an outfit at Aimee, chances are you won’t see it on anyone else. That’s because owner Amy Hassebrock orders only a limited number of each garment, ensuring her customers get the unique look they’re shopping for. She offers a variety of eclectic U.S. and European lines, including Derby, Traffic People, Spiritual Gangster and Amanda Uprichard. The boutique’s home in a historic East Village building enhances its appeal, and, even better, you can sip a complimentary glass of wine while you shop. 426 E. Locust St.; 515-243-0045; facebook.com/aimeestyle. There’s a reason this men’s shop has been in business for more than 60 years: It consistently offers top-notch personal service and top-quality brands, such as Byron, Sunspel, Eton, Magnanni, and Luigi Bianchi Mantova. You’ll be outfitted in impeccable style, whether you’re negotiating a high-powered business deal or hanging out at your neighborhood bar. Find sports coats, polo and dress shirts, denim jeans, boots and shoes, custom-fitted suits, ties, leather goods and grooming products. Badowers also offers specialty services such as closet cleaning. 2817 Ingersoll Ave.; 515-283-2121; badowers.com. Dornink in the East Village specializes in custom couture, such as this silk dupioni top and skirt. An amethyst and sterling silver necklace, bracelet and ring, all made by jeweler Ann Au, complete the look. Photographer: Whitney Warne, Ivory House Photography. Custom couture by Des Moines designer and expert dressmaker Sarah Dornink distinguishes this East Village boutique. Her exquisite creations include bridal gowns, eveningwear and cocktail attire; the high-quality pieces are custom-made to accentuate the qualities of each client. The boutique also carries bridal jewelry, as well as everyday accessories. 518 E. Grand Ave.; 515-255-7528; dornink.com. Elevated elegance is the hallmark of this upscale women’s boutique, which owner Kelli Schulz opened in 2000. The dedicated and knowledgeable staff will help outfit you in sophisticated, wow-worthy ensembles from such notable designers as Rachel Zoe, Malene Birger, Hugo Boss and Theory. The store’s reputation reaches beyond Greater Des Moines; its clothing division has been featured in national magazines including Harper’s Bazaar, In-Style and O, the Oprah Magazine. 2600 University Ave., Suite 120, West Des Moines; 515-225-4020; krenee.com. This 40-year-old menswear store is serious about service: It employs seven full-time on-site tailors, who will make sure you have the perfect fit, whether you’re shopping for business dress, business casual or weekend wear. The store carries dozens of desirable brands in apparel (St. Croix, Enro, Angelo Nardelli) shoes (Allen Edmonds, Santoni, Cole Haan) and accessories (Bresciani, Pantherella, VK Nagrani). Mr B also offers wardrobe consultation—helping you work with what’s already in your closet to create looks for a variety of occasions. 1995 N.W. 86th St., Clive; 515-276-8589; mrbclothing.com. Check off your casual clothing needs at this contemporary men’s and women’s shop run by mother-daughter duo Paula Woodward-Correy and Hailey Hageman. The West Glen store offers chunky sweaters, graphic tees, denim, sundresses, shorts, button-ups and rompers—as well as a selection of dressier pieces—from brands like LNA, Mavi, Mizzen+Main, AG, Black Orchid and Young Fabulous & Broke. Accessories like stylish men’s socks from Ted Baker and Dana Reed jewelry add a finishing touch to every ensemble. 5545 Mills Civic Parkway, Suite 100, West Des Moines; 515-267-8953; paulaandcorrey.com. 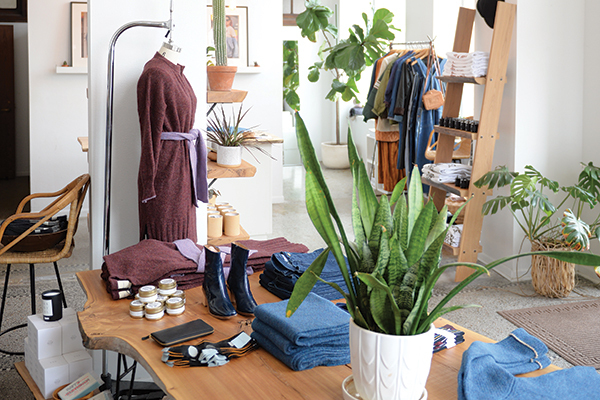 The engaging displays of vintage and contemporary clothing, footwear and accessories create an inviting atmosphere at Preservation in the East Village. Reminiscent of a Brooklyn boutique, Preservation’s bright plant-filled space offers a welcoming vibe to pair with its blend of vintage and modern women’s fashions. In her historic-hotel-turned-shop location (pictured, left), owner Nicole Lorenson carefully curates a collection of hip vintage pieces from around the U.S. that look brand new, including denim, tees, jackets, dresses and jumpsuits. The store also features contemporary clothing, footwear and accessories from rising designers (Paloma Wool, Komono, and Hackwith Design House, among others) as well as Brooklyn Candle Studio candles and other small home goods. 321 E. Walnut St.; 516-765-1607; shoppreservation.com. Renee’s draws you in with its warm environment that recalls an Old World French country boutique—and then keeps you there with friendly, helpful service and an assortment of top contemporary brands such as Simpli, Kahngura, Joseph Ribkoff and Dolcezza. Owner Desiree Renee Johnson, who opened the Valley Junction boutique in 2017, will help you put together a smart and comfortable look that’s the right style and fit for you, whether it’s a simple yet elegant tee and pant outfit, a boldly patterned blazer or a flirty dress. 221 Fifth St., West Des Moines; reneesiowa.co. Since taking over ownership of this Ingersoll mainstay a few years ago, Mary Langen has infused it with a fresh vitality that draws both longtime and new customers. With a focus on personalized service, Langen has stocked the boutique with a well-chosen selection of classic and contemporary clothing brands, including Johnny Was, Eileen Fisher, White + Warren and Estelle and Finn, plus distinctive jewelry, Suzi Roher belts and scarves, and other accessories. 2725 Ingersoll Ave; (515) 283-2725; silverfoxdsm.com. Browse the racks at Velvet Coat for upscale women’s clothing that achieves the right balance of fashion-forward style and Midwest practicality. The store offers a mix of timeless classics—blazers, blouses, skirts—as well as a collection of dresses, sweaters and pants with trendier cuts and prints. All of the high-quality pieces (brands include Rag & Bone, Brodie Cashmere, Ecru, Velvet, M Missoni, and Frame) can easily transition from the office to a night on the town. Complete your outfit with jewelry, scarves, bags and footwear from Il Bisonte, Freda Salvador or Trask. 219 E. Grand Ave., Suite 110; 515-244-6308; velvetcoat.us. Every time we stop in this Valley Junction shop, we find ourselves loving everything owner and jeweler Ann Au has to offer. That starts with her exquisitely made statement pieces, including rings, necklaces, earrings and bracelets featuring precious and semiprecious gemstones. The gallery also carries other jewelry brands (Monies, among others) as well as beautiful, one-of-a-kind decorative items (ceramics by Elizabeth Peckacek, for example) and accessories. 200 Fifth St., West Des Moines; 515-255-76512; aulimited.com. Bruce Owen strives to deliver on the slogan “Made locally, artistically, and specifically for you.” In fact, the service is so personal that the elegantly compact East Village studio is open by appointment only, one-on-one, jeweler and customer. A veteran of three decades in the jewelry business, Owen has seen every aspect of the industry, from giant diamond mines in South Africa to tiny details examined in his studio with a jeweler’s loupe. Custom services include designing rings, necklaces, bracelets and earrings. 307 E. Fifth St.; 515-201-8444; bruceowenjewelrydesign.com. Nestled among the Shops at Roosevelt along 42nd Street, the bright and contemporary gallery of Elements Ltd. brims with jewelry, metalsmith artwork and, as it says on the front window, “other treasures.” Custom jewelry is the hallmark, but Elements also offers contemporary pieces created by other Iowans and even international artists. Elements’ jewelers work with traditional metals—gold, silver and platinum—and also specialty options such as meteorite and Damascus steel. Diamonds and colored gemstones are featured in much of their work, and most pieces are either one-of-a-kind or limited edition. They also provide a range of jewelry services and repairs. 837 42nd St.; 515-277-7421; elementslimited.com. For almost 150 years, since their first shop in the Kirkwood Hotel, members of the Joseph family have furnished Iowans with top-quality watches, jewelry and gifts of distinction. In our experience, the company’s signature gold gift-wrap has never failed to build eager anticipation in its recipients. In addition to generations of custom jewelry, expect excellence in watches (starting with Rolex), jewelry from respected brands such as John Hardy Jewelry and Tara Hutch Designs, and gifts for all occasions. Josephs has two sparkling locations, downtown and “out west”: 215 10th St., 515-283-1961; and 5425 Mills Civic Parkway, West Des Moines; 515-440-2991; josephsjewelers.com. Stop into Accents & Interiors to find the finishing touch for every room in your home. A handful of larger furnishings from Bassett Furniture, Four Hands and Bernhardt anchor the store, but owner Shelley Pigneri regularly rotates in fresh lines of decor and gift items to welcome in each season. Cozy faux furs, blankets and throw pillows add dimension to sofas, while marble serving boards and gold-accented barware will earn you “hostess-with-the-mostest” status. We love the Des Moines neighborhoods-themed pillows as well as coasters from local maker Cheers Ink. 2701 86th St., Urbandale; 515-276-7201; accentsdm.com. 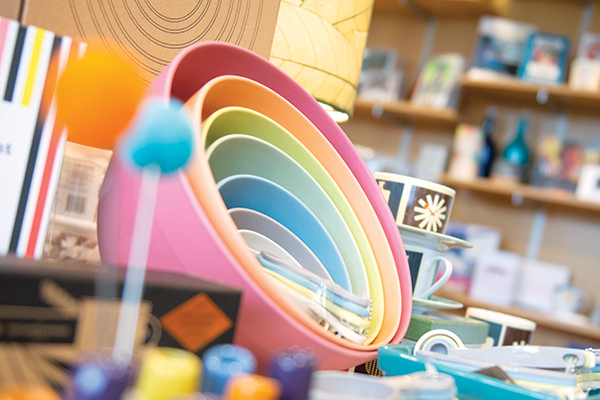 This Clive-based store caters to a variety of design tastes. Owner Bonita Clark and her team of designers will help you create the custom style you want, whether Euro contemporary (our favorite), modern casual, classic and traditional, or glam. You’ll find brands such as Berkley (sleek sectionals), Alton (contemporary dining tables), Tucker (mid century modern dressers) August (modern beds) and Isla (cool acrylic side tables). Finish your rooms with lamps, rugs, mirrors, wall art and more. 1490 N.W. 86th St., Clive; 515-225-2223; bydesignthestore.com. Owner Kathy Sorbe set up her spacious store as a one-stop shop for all things home, offering a wide range of furniture, lighting, art, rugs, gifts, tableware and more. The Elements manages to remain stylistically agnostic, catering to a variety of decorating tastes, including upscale elegance, modern farmhouse and urban contemporary. Don’t miss the beautiful centerpieces, colorful table linens, statement lighting, luxurious Ann Gish bedding and patio furniture from OW Lee and Summer Classics Home. We appreciate that custom furnishings from Lexington, Justice Furniture and Norwalk Furniture are also available. 1380 S.W. Vintage Parkway, Ankeny; 515-264-5563; elementsbyksorbe.com. This home furnishings store brims with elegance, thanks to its curated collection of furniture and accessories. A color palette of soothing natural hues—think whites, creams, blacks, grays, and marbles—feels serene. 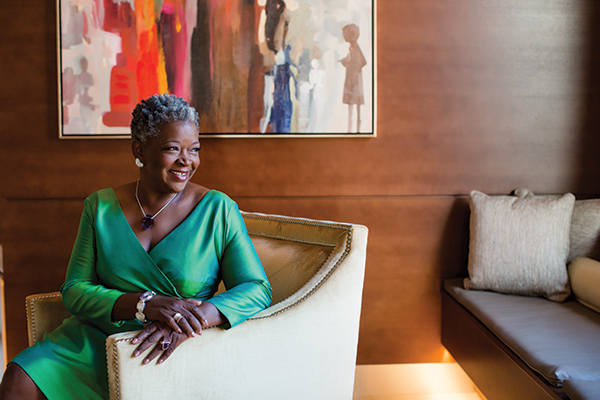 While simple in design, furnishings from Mitchell Gold + Bob Williams—K.Renee’s premiere line—often include moments of brass, platinum or acrylic for a well-placed pop of refined character. The store stocks to sell, meaning you can take the item home that day. Or you can work with home stylists for a custom design. 2600 University Ave., Suite 120, West Des Moines; 515-225-4020; krenee.com. Furniture seems to double as art in this window-rimmed showroom. Established in 1998 by Kelli Linnemeyer, Projects Contemporary Furniture brings more than 50 big-name modern furniture designers, including Ligne Roset, B&B Italia, and Minotti, to the East Village and serves as the exclusive Iowa retail location for many world-renowned luxury brands. In addition, the store offers lighting from Bocci, Foscarini and Nemo; cabinetry from Poliform, Miele and Rifra; and accessories from Tom Dixon, Alessi and Kose. 501 E. Locust St.; 515-557-1833; projectsfurniture.com. Under the leadership of Beth Artis, Studio 28 offers some of the same fine furnishings as its sister store, Artis Furniture in Urbandale, while also catering to a younger, condo-dwelling demographic with clean-lined pieces that won’t crowd small spaces. To ensure quality craftsmanship, the store limits its lineup to American-made, family-owned manufacturers such as CR Laine, Stickley and Younger Furniture. Studio 28 also offers luxurious bed linens from Bella Notte, an impressive lineup of MacKenzie-Childs ceramics and dinnerware, and artwork from various Iowa-based artists. 2801 Ingersoll Ave.; 515-280-7161; artisfurniture.com/studio28. This Brooklyn-based brand feels at home in the Midwest thanks to subtle architectural nods like a checkout counter crafted from reclaimed barn materials. The 11,000-square-foot retail space offers shoppers midcentury-inspired modern furniture as well as lighting, bedding, dinnerware, art, pillows, rugs and botanical accessories. In addition to its own brand, the store sells Iowa-made items from makers like Libby Burns, Siberian Soap Co., and Over+Print. Eco-conscious shoppers can find fair trade and sustainably sourced goods throughout the store. 219 E. Grand Ave., Suite 101; 515-282-2020; westelm.com/stores/us/ia/des-moines. Whether we’re looking for a beautiful, artisan-made serving bowl or a functional kitchen appliance, we’re unlikely to walk out of Teresa Adams-Tomka’s cozy kitchen goods store empty-handed. Shelves are stacked high with quality cookware from respected brands like Le Creuset, Finex and Emile Henry; retro-inspired Smeg countertop appliances; kitchen supplies from Epicurean and OXO; and a rotating mix of classic, elegant and quirky dinnerware sets by Vietri, Pillivuyt, Anna Weatherley and more. Don’t miss Kitchen Collage’s cooking classes or the free demos the first Friday evening of every month. 430 E. Locust St.; 515-270-8202; mykitchencollage.com. Collaborate with Ichi Bike to create a tricked-out two-wheeler that’ll make a statement on the streets—and the trails. Owner Daniel Koenig infuses a rad, rocker vibe into his shop, which specializes in building custom, one-of-a-kind bicycles (cruisers, wheelies, cargo bikes) as well as restoring vintage cycles. Ichi (which means “No. 1” in Japanese) is also the metro’s premiere electric bicycle dealer, offering bikes from Blix, Yuba, Gocycle, Haibike, IZIP and Day 6. You can browse traditional bikes from Masi, Felt and others as well as a generous helping of bike parts and gear. And upgrade your style by nabbing one of the shop’s namesake T-shirts designed by Koenig’s wife, artist Amy Putney Koenig. 311 E. Walnut St.; 515-274-0397; ichibike.com. Both two- and four-legged shoppers are welcome at this East Village pet supply shop that got its start in 2009. Jett & Monkey carries top pet food brands, including Orijen, Fromm and Honest Kitchen, that cater to special diets like grain-free and holistic. The store also offers USA-made, eco-friendly pet gear, including custom bedding, sweaters, grooming supplies, collars, toys and even baked “happy birthday” pet treats. Store owners Josh Garrett and Jennifer Brooks also work with rescue organizations to coordinate pet adoptions. 503 E. Locust St.; 515-244-4211; jettandmonkey.com. Low lighting and a bubbling fountain lend a Zen-like atmosphere to this teahouse. Store owners Mike Feller and Rusty Bishop made multiple trips to meet with tea producers across Asia before selecting 150 white, yellow, green, oolong, puerh, herbal and black loose-leaf teas to offer at Gong Fu Tea. Shelves of jars filled with tea leaves line one wall for beginners and connoisseurs alike to assess the aromas before purchasing. Not sure where to start? The staff can help you find the right tea for your taste or health goals. Sip at the shop, or buy in bulk by the ounce for home enjoyment. Accessories—including teapots, cups and storage cannisters—are also available. 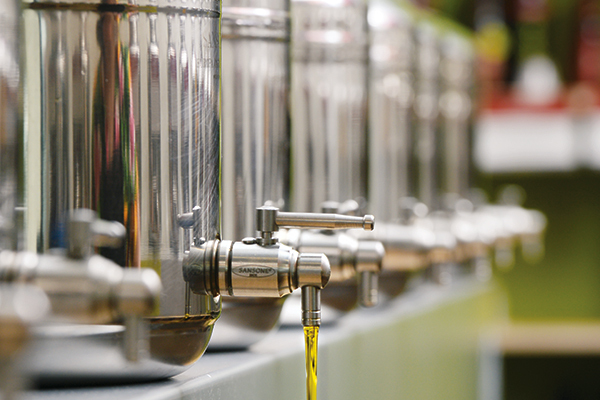 Inquire about the shop’s tea presentations to experience and learn about traditional tea preparation. 414 E Sixth St.; 515-288-3388; gongfu-tea.com. Instantly escape the urban hustle and bustle—or banish winter blues—by entering this oasis of plants and art. Art Terrarium, located in downtown’s Elevencherry building, offers a variety of small to midsize houseplants for sale (cactuses, succulents, air plants and more) as well as handmade planters and macramé plant hangers. At the shop’s Potting Bar, you can create terrariums, pot new plants or even bring in your own containers for a repotting session. Prints and paintings by local artists are available for purchase. 106 11th St.; 515-346-4155; artterrarium.com. Let your nose be your guide through this East Village shop—just follow the aromas. Co-owned by Rory Brown and Andy Haning-Brown, AllSpice sells over 350 herbs, spices, oils and vinegars. Stock up on staples, or break out of a recipe rut with adventurous seasonings like smoked bacon salt or truffled parmesan rub. Grab boxed sets (Curry On or Veg Out, among others) as fresh gift ideas. Bakers won’t walk out empty-handed either: The shop offers a variety of powders, cinnamons and sanding sugars. 400 E. Locust St., Suite 5; 515-868-0808; allspiceonline.com. After enjoying the Art Center’s galleries of fine art, stop by the museum shop for art-related books, puzzles and posters. Want to flex your own creative skills? Pick up art journals, adult coloring books, watercolor kits and more. The store also stocks gift items like kitchenware from Bamboozle and Areaware; stuffed animals, books and minimalist toys for children; fair trade Zulu baskets and Beyond Threads necklaces; and silver jewelry from Midwest artisans. 4700 Grand Ave. 515-271-0330; desmoinesartcenter.org/shop. 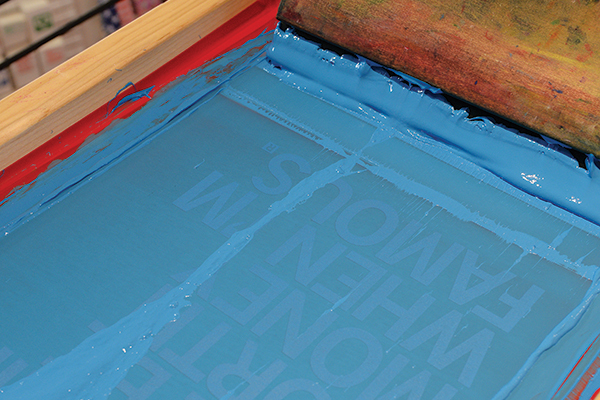 The screen printing is just as local and colorful as the witticisms created at Raygun, a store so cool that it doesn’t just draw shoppers, it attracts tourists. We dare you not to chuckle while shopping in this clever T-shirt store launched by Mike Draper in 2004. Best known for its humorous, Midwest-themed tees and accessories (“Iowa: Wave the next time you fly over!” and “Actually, we’re just outside the middle of nowhere”), the Raygun flagship store offers 7,000 square feet of fun. Raygun also stocks a rotating mix of casual fashion for men and women, home goods, local artwork, and books as well as gift items printed with the store’s signature witticisms. 505 E. Grand Ave.; 515-288-1323; raygunsite.com. 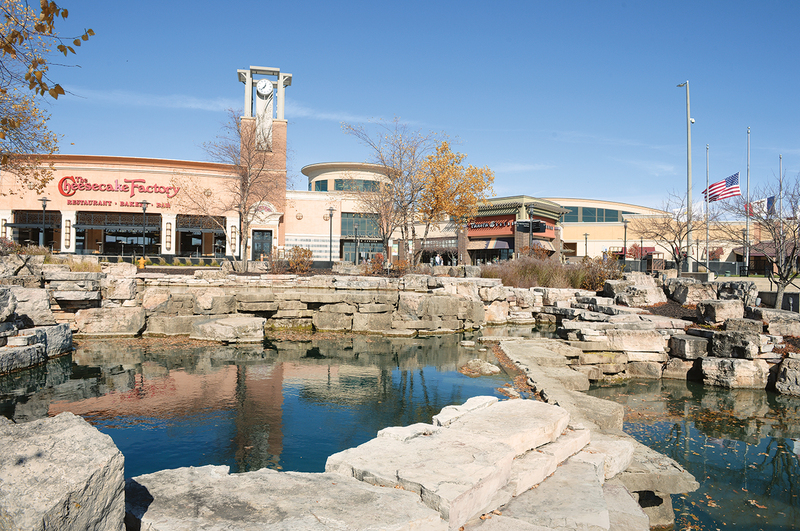 Jordan Creek Town Center: Jordan Creek (pictured, above) takes the title of Iowa’s largest mall, offering a wide range of upscale stores to match the designation, including Anthropologie, Lululemon, Coach, Williams-Sonoma, the Apple Store, White House Black Market, Vera Bradley, and J.Crew. After a day of shopping, grab dinner at one of several restaurants before catching a flick at the mall’s 20-screen theater. End the evening with a stroll along the boardwalk. East Village: Des Moines’ 150-plus-year-old Historic East Village boasts an eclectic lineup of hip, locally owned shops with diverse offerings. Between the Des Moines River and the Capitol building, you’ll find boutiques focused on clothing (Dornink, Minijoops, Fontenelle Supply Co.); gifts and paper products (Ephemera, Domestica, Permanent Collection); cooking (AllSpice Culinarium, Kitchen Collage); lingerie (Amour); beauty (Eden); and more. Valley Junction: Visit Historic Valley Junction for a small-town main street experience in the middle of the metro. This walkable West Des Moines shopping district offers antiques (A Okay Antiques, Hinge); art (Olson-Larsen Galleries, From Our Hands); gifts (Heart of Iowa Market Place, Bing’s, MoMere); clothing (Renee’s); jewelry (2AU Limited); and crafts (The Quilt Block, Yarn Junction Co.). A farmers market with 100 weekly vendors occurs every Thursday from May until September. West Glen: Offering a downtown feel with the convenience of the suburbs, the West Glen district defies suburban stereotypes by offering an ample number of locally owned shops and restaurants. Shop sustainably at higher-end resale shops (Worn, Plato’s Closet, Style Encore) or get new men’s and women’s fashions at Paula & Correy Style Boutique. Put a ring on it at Josephs Jewelers, then find “the dress” at Schaffer’s Bridal. Don’t leave without ducking into Hurts Donut, a 24/7 doughnut shop, or grabbing wine and gifts at WineStyles Tasting Station. University West: Shopping opportunities stretch for a mile or more, lining both sides of University Avenue through West Des Moines, from 22nd Street to Interstate 80/35. It’s mostly a chain gang, including familiar names such as Pier One, Von Maur, TJ Maxx, Home Depot, Best Buy, World Market, Barnes & Noble, Galaxy Golf, Bed Bath & Beyond … and beyonder. The street is flanked by clusters of small shopping centers. A whimsical cottage forms the centerpiece of an enchanting backyard.